I'm off to Switzerland tomorrow! Super excited, we're going to go off the beaten track and go for walks by the lakes and in the mountains. I'm such an outdoors girl at heart, so I think I'll feel very much at home there. This is my ideal outfit wish list for my trip! Dungarees are everywhere, and I'm in love with this acid wash pair (are dungarees considered a pair? You have a pair of shorts I guess...?). 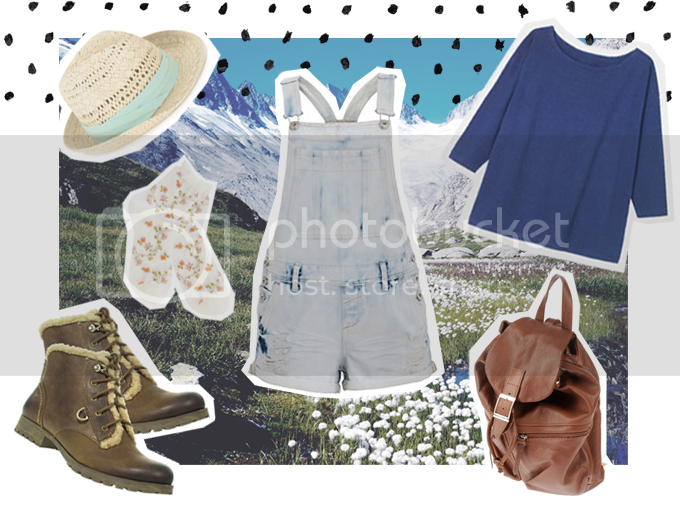 This outfit is chilled and relaxed, with practical shoes for those rocky mountain walks! I've picked out a dainty floral pair of socks to go with them too. Straw hats just look fabulous, especially in the country, so this hat will keep the sun off your bonce. Whats your favourite item? Love em! They're quite affordable and perfect for summer! I love this outfit so much. Hope you have a fabulous time in Switzerland; I'm so jealous. I'd love to go there! Ah wow, i've just stumbled upon your blog and its so beautiful, I love the way you've laid this out, it really is lovely! Those dungaree's are so nice too! I've recently started up a new blog adnd would love it if you had a look! Thankyou! These boots are SO cute! Love your blog and how you edit your pictures! They are so much fun to look at! And of course those dungarees and hat you've featured are super cute!